Monasticism (from Greek μοναχός, monachos, derived from μόνος, monos, 'alone') or monkhood is a religious way of life in which one renounces worldly pursuits to devote oneself fully to spiritual work. Monastic life plays an important role in many Christian churches, especially in the Catholic and Orthodox traditions. Similar forms of religious life also exist in other faiths, most notably in Buddhism, but also in Hinduism and Jainism, although the expressions differ considerably. By contrast, in other religions monasticism is criticized and not practiced, as in Islam and Zoroastrianism, or plays a marginal role, as in Judaism. Many monastics live in monasteries to stay away from the secular world. The way of addressing monastics differs between the Christian traditions. As a general rule, in Roman Catholicism, monks and nuns are called brother or sister, while in Eastern Orthodoxy, they are called father or mother. The Sangha or community of ordained Buddhist bhikkhus ("beggar" or "one who lives by alms".) and original bhikkhunis (nuns) was founded by Gautama Buddha during his lifetime over 2500 years ago. This communal monastic lifestyle grew out of the lifestyle of earlier sects of wandering ascetics, some of whom the Buddha had studied under. It was initially fairly eremitic or reclusive in nature. Bhikkhus and bhikkunis were expected to live with a minimum of possessions, which were to be voluntarily provided by the lay community. Lay followers also provided the daily food that bhikkhus required, and provided shelter for bhikkhus when they needed it. After the Parinibbana (Final Passing) of the Buddha, the Buddhist monastic order developed into a primarily cenobitic or communal movement. The practice of living communally during the rainy vassa season, prescribed by the Buddha, gradually grew to encompass a settled monastic life centered on life in a community of practitioners. Most of the modern disciplinary rules followed by bhikkhus and bhikkhunis — as encoded in the Patimokkha — relate to such an existence, prescribing in great detail proper methods for living and relating in a community of bhikkhus or bhikkhunis. The number of rules observed varies with the order; Theravada bhikkhus follow around 227 rules, the Vinaya. There are a larger number of rules specified for bhikkhunis (nuns). The Buddhist monastic order consists of the male bhikkhu assembly and the female bhikkhuni assembly. Initially consisting only of males, it grew to include females after the Buddha's stepmother, Mahaprajapati, asked for and received permission to live as an ordained practitioner. Bhikkhus and bhikkhunis are expected to fulfill a variety of roles in the Buddhist community. First and foremost, they are expected to preserve the doctrine and discipline now known as Buddhism. They are also expected to provide a living example for the laity, and to serve as a "field of merit" for lay followers—providing laymen and women with the opportunity to earn merit by giving gifts and support to the bhikkhus. In return for the support of the laity, bhikkhus and bhikkhunis are expected to live an austere life focused on the study of Buddhist doctrine, the practice of meditation, and the observance of good moral character. 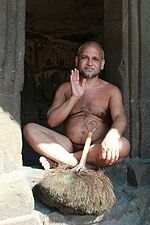 A bhikkhu (the term in the Pali language) or bhikshu (in Sanskrit), first ordains as a Samanera (novice). Novices often ordain at a young age, but generally no younger than eight. Samaneras live according to the Ten Precepts, but are not responsible for living by the full set of monastic rules. Higher ordination, conferring the status of a full Bhikkhu, is given only to men who are aged 20 or older. Bhikkhunis follow a similar progression, but are required to live as Samaneras for longer periods of time- typically five years. The disciplinary regulations for bhikkhus and bhikkhunis are intended to create a life that is simple and focused, rather than one of deprivation or severe asceticism. However, celibacy is a fundamental part of this form of monastic discipline. The Monastery of Saint Anthony in Egypt, built over the tomb of Saint Anthony, the "Father of Christian Monasticism". Monasticism in Christianity, which provides the origins of the words "monk" and "monastery", comprises several diverse forms of religious living. It began to develop early in the history of the Church, but is not mentioned in the scriptures. It has come to be regulated by religious rules (e.g. the Rule of St Basil, the Rule of St Benedict) and, in modern times, the Church law of the respective apostolic Christian churches that have forms of monastic living. The Christian monk embraces the monastic life as a vocation for God. His goal is to attain eternal life in his presence. The rules of monastic life are codified in the "counsels of perfection". In the beginning, in Egypt, Christians felt called to a more reclusive or eremitic form of monastic living (in the spirit of the "Desert Theology" for the purpose of spiritual renewal and return to God). Saint Anthony the Great is cited by Athanasius as one of these early "Hermit monks". Especially in the Middle East, eremitic monasticism continued to be common until the decline of Syriac Christianity in the late Middle Ages. Monastery of Saint Anthony, one of the oldest Christian monasteries in the world. Mar Awgin founded a monastery on Mt. Izla above Nisibis in Mesopotamia (c. 350), and from this monastery the cenobitic tradition spread in Mesopotamia, Persia, Armenia, Georgia and even India and China. St. Sabbas the Sanctified organized the monks of the Judean Desert in a monastery close to Bethlehem (483), now known as Mar Saba, which is considered the mother of all monasteries of the Eastern Orthodox churches. Saint Catherine's Monastery was founded between 527 and 565 in the Sinai Peninsula, Egypt by order of Emperor Justinian I. In the West, the most significant development occurred when the rules for monastic communities were written, the Rule of St Basil being credited with having been the first. The precise dating of the Rule of the Master is problematic; but it has been argued on internal grounds that it antedates the so-called Rule of Saint Benedict created by Benedict of Nursia for his monastery in Monte Cassino, Italy (c. 529), and the other Benedictine monasteries he himself had founded (cf. Order of St Benedict). It would become the most common rule throughout the Middle Ages and is still in use today. The Augustinian Rule, due to its brevity, has been adopted by various communities, chiefly the Canons Regular. Around the 12th century, the Franciscan, Carmelite, Dominican, Servite Order (see Servants of Mary) and Augustinian mendicant orders chose to live in city convents among the people instead of being secluded in monasteries. St. Augustine's Monastery, founded in 1277 in Erfurt, Germany is regarded by many historians and theologians as the "cradle of the Reformation", as it is where Martin Luther lived as a monk from 1505 to 1511. Today new expressions of Christian monasticism, many of which are ecumenical, are developing in various places such as the Bose Monastic Community in Italy, the Monastic Fraternities of Jerusalem throughout Europe, the New Skete, the Anglo-Celtic Society of Nativitists, the Taizé Community in France, and the mainly Evangelical Protestant New Monasticism. It is possible that intentional communities such as the Bruderhof could be considered monastic, since they share everything, have a rhythm of life and prayer, and have a degree of separation from the world. Rod Dreher, editor of The American Conservative, said of the Bruderhof, "It would not be stretching it to call them lay monastics". In their quest to attain the spiritual goal of life, some Hindus choose the path of monasticism (Sannyasa). Monastics commit themselves to a life of simplicity, celibacy, detachment from worldly pursuits, and the contemplation of God. A Hindu monk is called a sanyāsī, sādhu, or swāmi. A nun is called a sanyāsini, sādhvi, or swāmini. Such renunciates are accorded high respect in Hindu society, because their outward renunciation of selfishness and worldliness serves as an inspiration to householders who strive for mental renunciation. Some monastics live in monasteries, while others wander from place to place, trusting in God alone to provide for their physical needs. It is considered a highly meritorious act for a lay devotee to provide sadhus with food or other necessaries. Sādhus are expected to treat all with respect and compassion, whether a person may be poor or rich, good or wicked. They are also expected to be indifferent to praise, blame, pleasure, and pain. A sādhu can typically be recognized by his ochre-colored clothing. Generally, Vaisnava monks shave their heads except for a small patch of hair on the back of the head, while Saivite monks let their hair and beard grow uncut. Islam forbids the practice of monasticism. In Sunni Islam, one example is Uthman bin Maz'oon; one of the companions of Muhammad. He was married to Khawlah bint Hakim, both being two of the earliest converts to Islam. There is a Sunni narration that, out of religious devotion, Uthman bin Maz'oon decided to dedicate himself to night prayers and take a vow of chastity from his wife. His wife got upset and spoke to Muhammad about this. Muhammad reminded Uthman that he himself, as the Prophet, also had a family life, and that Uthman had a responsibility to his family and should not adopt monasticism as a form of religious practice. In Jainism, monasticism is encouraged and respected. Rules for monasticism are rather strict. A Jain ascetic has neither a permanent home nor any possessions, wandering barefoot from place to place except during the months of Chaturmas. The quality of life they lead is difficult because of the many constraints placed on them. They don't use a vehicle for commuting and always commute barefoot from one place to another, irrespective of the distance. They don't possess any materialistic things and also don't use the basic services like that of a phone, electricity etc. They don't prepare food and live only on what people offer them. Judaism does not encourage the monastic ideal of celibacy and poverty. To the contrary—all of the Torah's Commandments are a means of sanctifying the physical world. As further disseminated through the teachings of the Yisrael Ba'al Shem Tov, the pursuit of permitted physical pleasures is encouraged as a means to "serve God with joy" (Deut. 28:47). However, until the Destruction of the Second Temple, about two thousand years ago, taking Nazirite vows was a common feature of the religion. Nazirite Jews (in Hebrew: נזיר) abstained from grape products, haircuts, and contact with the dead. However, they did not withdraw from general society, and they were permitted to marry and own property; moreover, in most cases a Nazirite vow was for a specified time period and not permanent. In Modern Hebrew, the term "Nazir" is most often used to refer to non-Jewish monastics. 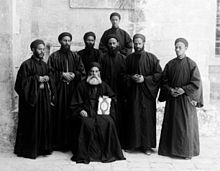 Unique among Jewish communities is the monasticism of the Beta Israel of Ethiopia, a practice believed to date to the 15th century. A form of asceticism was practiced by some individuals in pre–World War II European Jewish communities. Its principal expression was prishut, the practice of a married Talmud student going into self-imposed exile from his home and family to study in the kollel of a different city or town. This practice was associated with, but not exclusive to, the Perushim. The Essenes (in Modern but not in Ancient Hebrew: אִסִּיִים, Isiyim; Greek: Εσσηνοι, Εσσαιοι, or Οσσαιοι; Essēnoi, Essaioi, or Ossaioi) were a Jewish sect that flourished from the 2nd century BC to AD 100 which some scholars claim seceded from the Zadokite priests. Being much fewer in number than the Pharisees and the Sadducees (the other two major sects at the time), the Essenes lived in various cities but congregated in communal life dedicated to asceticism, voluntary poverty, daily immersion (in mikvah), and abstinence from worldly pleasures, including (for some groups) marriage. Many separate but related religious groups of that era shared similar mystic, eschatological, messianic, and ascetic beliefs. These groups are collectively referred to by various scholars as the "Essenes". Josephus records that Essenes existed in large numbers, and thousands lived throughout Roman Judaea. The Essenes have gained fame in modern times as a result of the discovery of an extensive group of religious documents known as the Dead Sea Scrolls, which are commonly believed to be the Essenes' library—although there is no proof that the Essenes wrote them. These documents include multiple preserved copies of the Hebrew Bible which were untouched from as early as 300 years before Christ until their discovery in 1946. Some scholars, however, dispute the notion that the Essenes wrote the Dead Sea Scrolls. Rachel Elior, a prominent Israeli scholar, even questions the existence of the Essenes. China's Wudang Mountains is a center of Taoist monasticism and the practice of Tai chi. Ananda Marga has both monks and nuns (i.e. celibate male and female acharyas or missionaries) as well as a smaller group of family acharyas. 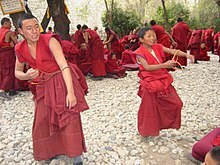 The monks and nuns are engaged in all kinds of direct services to society, so they have no scope for permanent retreat. They do have to follow strict celibacy, poverty and many other rules of conduct during as well as after they have completed their training. Bön is believed to have a rich monastic history. Bön monasteries exist today, and the monks there practice Bön-Buddhism. Manichaeism had two types of followers, the auditors, and the elect. The elect lived apart from the auditors to concentrate on reducing the material influences of the world. They did this through strict celibacy, poverty, teaching, and preaching. Therefore, the elect were probably at least partially monastic. Scientology maintains a "fraternal order" called the Sea Organization or just Sea Org. They work only for the Church of Scientology and have signed billion year contracts. Sea Org members live communally with lodging, food, clothing, and medical care provided by the Church. Sikhism and the Bahá’í Faith both specifically forbid the practice of monasticism. Hence there are no Sikh or Bahá’í monk conclaves or brotherhoods. Way of Former Heaven sect of Zhaijiao. The Transcendental Meditation movement sponsors two monastic groups: the Thousand-Headed Purusha for men and the Mother Divine for women. The US residences for the groups were in Heavenly Mountain, North Carolina. There is also a Purusha program at an ashram in Uttarkashi, India. The Global Mother Divine Organization describes itself as the women's wing of the Global Country of World Peace. Zoroastrianism holds that active participation in life through good thoughts, good words and good deeds is necessary to ensure happiness and to keep chaotic influences at bay. This active participation is a central element in Zoroaster's concept of free will, and Zoroastrianism rejects all forms of asceticism and monasticism. Into Great Silence—Documentary of life within the Carthusian monastery of La Grande Chartreuse by Philip Groning. ^ "Monasticism". Encyclopedia Britannica, Inc. Retrieved 6 October 2014. ^ Buddhist Dictionary, Manual of Buddhist Terms and Doctrines by Nyanatiloka Mahathera. ^ a b c "What is a bhikkhu?". En.dhammadana.org. Retrieved 12 April 2012. ^ "The Bhikkhuni question". Buddhistchannel.tv. 28 April 2009. Retrieved 12 April 2012. ^ "5 Beliefs That Set the Bruderhof Apart from Other Christians". Newsmax. Retrieved 24 June 2017. ^ "Life Among the Bruderhof". The American Conservative. Retrieved 7 December 2017. ^ Aditya Thakur (1 November 2014). "Just A Handful Of Hindus Know Adi Shankaracharya Revived Their Religion". Topyaps. Retrieved 16 May 2014. ^ Swami Bhaskarananda, Essentials of Hinduism 112 (Viveka Press 1994) ISBN 1-884852-02-5. ^ "Etiquette, Ethics, and Manners". Al Islam. Retrieved 5 June 2014. ^ admin@inter-islam-org. "Hazrat Sawdah". www.inter-islam.org. ^ Singhvi, Mrs. Sushila. "Jainism At A Glance". Archived from the original on 26 July 2011. Retrieved 9 November 2018. ^ Eliach, Y. There Once Was a World (Back Bay Books, 1998), p. 780. ^ F. F. Bruce, Second Thoughts on the Dead Sea Scrolls. Paternoster Press, 1956. ^ Hillel Newman, Ph.D. Bar Ilan University: Proximity to Power and Jewish Sectarian Groups of the Ancient Period, Brill, ISBN 90-04-14699-7. ^ Ilani, Ofri (13 March 2009). "Scholar: The Essenes, Dead Sea Scroll 'authors,' never existed". Haaretz. Retrieved 17 March 2009. ^ McGirk, Tim (16 March 2009). "Scholar Claims Dead Sea Scrolls 'Authors' Never Existed". Time. Retrieved 17 March 2009. ^ Schipper, Kristopher. The Taoist Body. (Berkeley: University of California Press, 1993 [original French version 1982]), p. 220. ^ "论宋元道教的社会化存在形态". Archived from the original on 31 July 2013. ^ a b Williamson, Lola (2010). Transcendent in America:Hindu-Inspired Meditation Movements as New Religion. NYU Press. p. 103. ISBN 978-0-8147-9450-0. ^ Massing, Dana (11 August 2007). "TM quiets mind, rests body says Erie man". Erie Times-News. p. 1. ^ "The Global Mother Divine Organization: About Us". gmdousa.org. Archived from the original on 7 October 2010. Fracchia, Charles. Living Together Alone: The New American Monasticism. Harper & Row, 1979. ISBN 0-06-063011-6. Wikisource has the text of the 1911 Encyclopædia Britannica article Monasticism. Historyfish.net: texts and articles regarding the Western Christian monastic tradition. Abbot Gasquet's English Monastic Life. Full Text + Illustrations. Public Domain Photochrom photographs, Abbeys, Cathedrals, Holy Sites and the Holy Land.